DVD to PSP Suite – a suite PSP conversion tool including DVD to PSP Converter for Mac and PSP movie converter for Mac. It is a discount software to convert DVDs and video to PSP on Macs. This PSP suite includes a series of practical features including setting video brightness, contrast, saturation, selecting DVD subtitle and audio track, trimming DVD and video, and merging multiple files into one file and so on. Watch your DVD movies and video files on the wide screen of your PSP player! A powerful PSP converter suite to rip DVD movie to PSP and convert video to PSP on Apple Mac OS X . Crop video to remove black sides from your DVDs or video files. Watching your DVD movies and video files on the wide screen of your PSP player is just a breeze with DVD to PSP Suite for Mac. 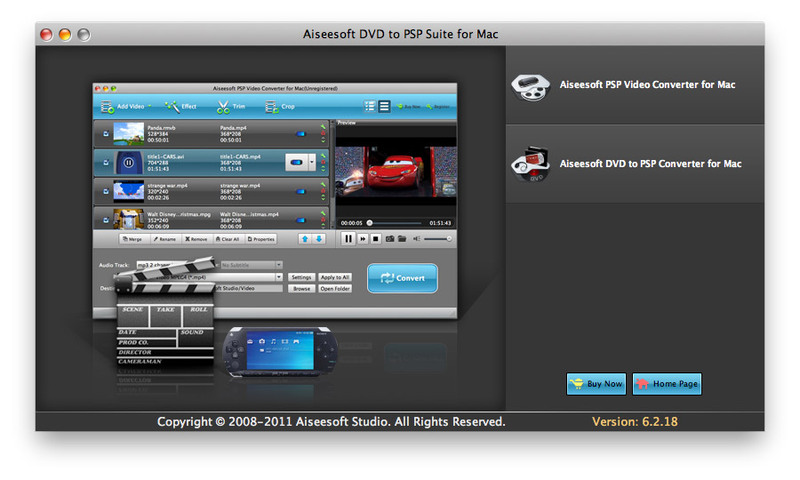 Why choose DVD to PSP Suite for Mac?